The land that is now Gunton Park was acquired by the Harbord family in 1670 for sporting use for which a hunting lodge was built. By damning the Hagon Beck two the lakes were formed, the Great Lake and the Gatehouse Pond which was visible from the front of the much extended hunting lodge. The Harbord’s had been ennobled in 1776 taking the title of Lord Suffield. As with many country estates except for specialist services the estate was self sufficient but it was the decision of the third Lord Suffield who took over the estate in 1821 to improve the estate that the decision was made to build the Watermill. With a considerable head of water behind the dam it made sense to use this as the power for the sawmill. 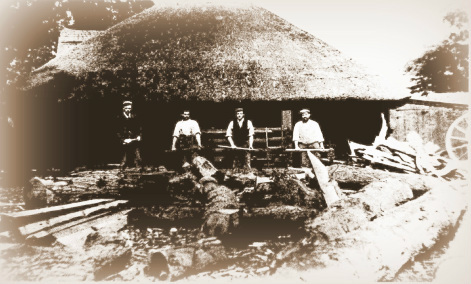 The mill became a reality in 1824, timber and thatch structure that housed a frame saw and an early circular saw. These were driven by separate waterwheels, the water having been used exited via the tail race and returned to Hagon Beck which after joining with Suffield Beck and the Blackwater flowed into the River Bure. As would seem appropriate the pond providing the water which had changed its name to the Old Farmhouse Pond now became Sawmill Pond. The frame saw was constructed mostly of wood being integral with the building the ironwork and castings being supplied by William Hase a local blacksmith and iron founder. As with many early machines the coming years saw various engineers and millwrights upgrading the saw and soon the original circular saw was replaced by one from Holmes of Norwich. This was soon followed by small corn mill by Ransome and Sims of Ipswich thus enabling the estate to grind its own flour. The work load in the mill mirrored to the requirements of the estate, with much of the improvement is complete the requirements to timber tailed off leading to a small side extension to the mill to house the estates carpentry and joinery shop. It was after the First World War that change really took place as the whole employment situation changed with many jobs normally undertaken by the estate contracted out. One must always take into account that the machinery was both old and outmoded and the waterwheels fell into disrepair. Locals tell that when sawing was required a portable engine pulled by horses would be brought on site to power the circular saw. Come 1942 the Second World War had created a great demand for timber and contractors were brought in to fulfil this need. They set up their own saw bench powered by a steam engine situated in a way that the crane could service the saw, both this and the steam engine were removed after the war leaving only the concrete mountings in situ. Things declined yet more the only sawing being provided by a small saw bench powered by belt drive off a tractor. Revival - A Close Run Thing! The rusty remains of the frame saw and the roof collapsed on the waterwheel control (wheel shut). 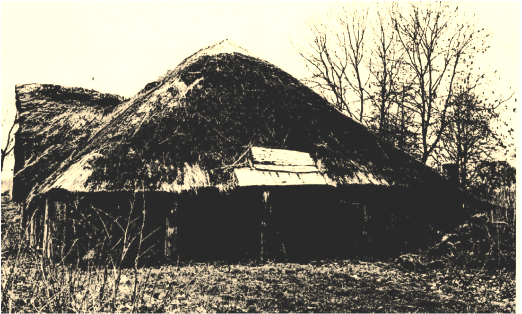 The Norfolk Industrial Archaeology Society were alerted to the parlous state of this unique mill and arranged a survey in 1976 and alerted the relevant bodies that action was needed if this historic artefact was to be preserved for the future. Soon the Norfolk County Council, Norfolk Windmill's Trust and the Norfolk Industrial Archaeology Society had drawn up a plan to preserve both the saw and building for future generations. In 1979 the last remaining Harbord, Doris to be tenant on the estate agreed to lease the site and duly signed a 999 year lease to the Norfolk Windmill's Trust who would oversee the restoration. Much of the work had to be done by professionals but as had been agreed when the building and machinery were once again in a usable state helped by the Norfolk Industrial Archaeology Society they set about rediscovering how the saw worked. Only three months after signing the lease Doris Harbord passed away and the Park was purchased by Kit Martin who soon became instrumental in forwarding the restoration. With new saw blades acquired in 1987 the following year the first cut was made on the restored saw. 1989 saw the first opening to the public and henceforth opened six times per year except for a break due to flooding in 1993. The new thatch being put on August 2013 - the final newly thatched roof and applying wood preservative Spring 2014 ready for the new season. As with all preserved buildings and old machinery it is a constant battle to keep things in working and good order and in 2013 we had once again to re-thatch the building and do repairs to the mill race. With these all complete once again will we make opening to the public for our six advertised openings for the year. Kit Martin with his desire to see old buildings restored and put to use has made many of the redundant buildings into homes. This has brought the estate back to life making the park once again a place of beauty. This said we would ask visitors to the mill to respect the privacy of the residents and not stray to far from the sawmill and please only visit on advertised open days.